Continuing with the “Han in Stormtrooper” theme, here’s Hasbro’s unleashed Han in Stormtrooper. 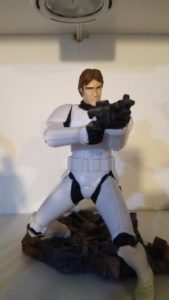 This figure was really pretty disappointing, as it’s the exact same post as their unleashed Stormtrooper figure. They just swapped the head, and included the trash compactor base instead of the Death Star base.